Round up the local ET-fighting militia — the first ever video footage from alien invasion TV series Falling Skies is out. We like the look of the aliens, and Steven Spielberg's producer credit. But will the show itself be good? 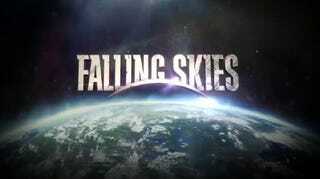 FALLING SKIES is an exciting new series from DreamWorks Television and executive producer Steven Spielberg. Noah Wyle (ER, TNT's The Librarian movies) stars as a former college professor who becomes the leader of a group of soldiers and civilians struggling against an occupying alien force. Moon Bloodgood (Terminator Salvation) co-stars as Anne Glass, a therapist who works with the surviving children to help them cope with the traumatic situation. The series also stars Drew Roy (Lincoln Heights) as Hal and Maxim Knight (Brothers & Sisters) as Matt, Tom's two sons; and Seychelle Gabriel (Weeds) as Lourdes, an orphaned teenager who helps run the group's commissary. Will Patton (Armageddon, TNT's Into the West) will play a recurring role as a fierce resistance fighter. Falling Skies will be on TNT in June of 2011.